Clumps of bushy, bluish-green foliage with slender purple-tinted stems. 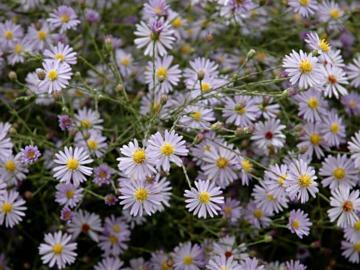 In autumn produces abundant airy panicles of small, pale lavender-violet flowers with yellow centres. Cut back hard in early winter or spring, before the new growth..
Wild appearance, good for "prairie" or "steppe" type plantings. Mixes well with grasses. Native to the prairies of central North America.